Midgar as it appears in Smash. for 3DS Main: Let the Battles Begin! for Wii U Let the Battles Begin! Ultimate Main: Let the Battles Begin! Midgar (ミッドガル, Midgar) is a Final Fantasy stage in Super Smash Bros. 4 which is available as downloadable content, as part of a set with Cloud. The stage returns in Super Smash Bros. Ultimate. In Ultimate, Cloud is fought here for his unlock battle. 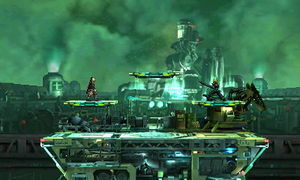 The basic layout of the stage consists, like Battlefield, of a main platform with three overhanging soft platforms in a triangle formation; however, the stage is slightly larger. Summon Materia occasionally float around the stage and stops in a random location with a flash. When a character touches it they are surrounded by magical symbols, then a monster is summoned which unleashes an attack with greatly disruptive effects. Ifrit: uses Hellfire (Called Inferno by Masahiro Sakurai during the Final Video Presentation). A huge flame erupts randomly either under the middle of the stage (raising it), under one of its sides (heavily tilting it to the side), or from one of the lateral blast lines (pushing the stage towards the other lateral blast line). Contact with the main body of the flame deals 26%, while contact with its weaker parts deals 1% with no knockback. The summoner is immune. Ramuh: uses Judgment Bolt. The three floating platforms are electrified and their arrangement changes to another random one. The three platforms then, one by one, randomly glow and get electrified again. After all three have undergone this process they return to their original position. Landing on an electrified platform paralyzes fighters and deals continuous damage (up to 21%) before launching them; simply passing through them deals damage but will not paralyze. The summoner is immune. The stage split in half by Odin's attack. Odin: uses Zantetsuken. Odin slices through the stage with his sword, splitting the main platform and the top floating platform in half. Characters hit by this attack, except the summoner, receive 100% (or rarely 200% damage), and in most cases are OHKO'd. In Ultimate, this attack triggers a Special Zoom. While the stage is split, its inner ledges can be grabbed. The stage pulls itself back together after a while, crushing any character, summoner included, caught between the two halves or hanging from the inner ledges. The stage flooded by Leviathan's attack. Leviathan: uses Tsunami. The entire arena is flooded, making the main platform surf across a huge body of water. A strong current pushes swimming characters to the left; getting slammed into the right side of the stage deals 9% damage or, if the character has 100% or more damage, an instant KO. The summoner is susceptible to the current and the slam damage, but not to the instant KO. If a player happens to have invincibility and enters the water on the right side of the stage, the player may be carried away by the current when it subsides or pushed under the stage to the left side due to not slamming into it. Fighters who enter the water under the effects of the Super Mushroom are trapped in the water (if on the right side) due to the low knockback and potentially KOed. This feature is not present in Super Smash Bros. for Nintendo 3DS, due to the removal of swimming in said game. Bahamut ZERO: Attacks with a devastating Teraflare, which destroys the city in the background and creates a damaging pillar of light covering about 1/3 of the stage. Getting caught in the beam deals continuous damage, up to 39%. The summoner is immune. Any opponent KO'd by a monster's attack counts as a KO on behalf of the summoner. In 8-Player Smash mode, no summoned monsters appear if there are five or more players. If the game is paused in Training Mode, all summon effects are paused but the rest of the action keeps going. In both versions of Super Smash Bros. 4, in Training Mode, if the player summons a Smash Ball, the Summon Materia or the summons Leviathan and Ifrit will go away. In Super Smash Bros. 4, the Ω form removes the soft platforms and Summon Materia. In Super Smash Bros. Ultimate, the Ω form is identical to SSB4's Ω form, and the Battlefield form is identical to the normal form; however, they are slightly resized and reshaped to match Final Destination and Battlefield, respectively. Midgar as it originally appears in Final Fantasy VII. Midgar is the the first area visited in Final Fantasy VII and is where much of the game's beginning takes place. Midgar is the capitol city and power base of the Shinra Electric Power Company, who built it. The city is divided up into nine sectors. This stage appears to take place on Midgar's top plates, above the ground-level slums that were commonly explored in Final Fantasy VII. The Shinra Building, one of the most iconic locations in Final Fantasy VII, is visible in the background. A prominent dungeon within the game, it is the headquarters for the Shinra company which plays a central role in Final Fantasy VII's storyline. The building is where Cloud meets Red XIII, a sentient animal from Cosmo Canyon, and later discovers that his nemesis Sephiroth is still alive, and has killed Shinra's president. After Sephiroth summons Meteor, a cannon known as the Sister Ray is attached to the building and is powered by the six remaining Mako Reactors. Cloud's party returns to Midgar at this time to stop Shinra once and for all. Midgar is also seen in other media in the Compilation of Final Fantasy VII. In the film Final Fantasy VII: Advent Children, Midgar is mostly left in ruins as a result of Meteor's effects. In its stead, a city called Edge is built, where most of the movie's events take place, such as the outburst of the disease known as Geostigma. Cloud later fights Kadaj, and later Sephiroth, in the ruins of the Shinra Building. The ruins of Midgar are visited again in Dirge of Cerberus, where Vincent Valentine fights off the organization known as Deepground and the Omega Weapon, with a climatic confrontation against Weiss, the leader of Deepground, in the former President's Office. Summons are a recurring element in the Final Fantasy series since their introduction in Final Fantasy III. They are powerful creatures that can be summoned into battle to attack enemies or support the party. In Final Fantasy VII, they can be summoned by equipping specific Materia: all the summons appearing on this stage are also available in Final Fantasy VII. While the Ω form of this stage is allowed, the standard stage is banned in tournaments, as in Smash 4, it overcentralizes gameplay on collecting Materia to gain an advantage; in addition, the summons themselves are quite powerful and can result in unfair advantages to those who summoned them. 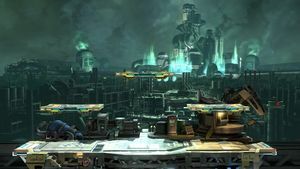 In Ultimate, the stage is banned due the layout being very similar to battlefield as with a few other stages. Midgar in Super Smash Bros. for Wii U. Cloud, Wii Fit Trainer, and Lucario with a Summon Materia. Midgar in Super Smash Bros. for Nintendo 3DS. 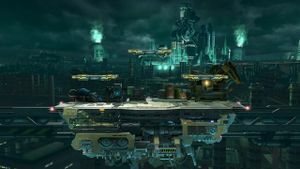 Panorama of Midgar from Ultimate. Cloud charging up his Limit Gauge next to Ifrit on the stage. Greninja using its neutral aerial with Leviathan on the stage. Piranha Plant on the stage. Ridley using his up special on the stage. Zero using Genmu Zero on Ridley on the stage. Midgar appears as a stage in the 2015 Dissidia Final Fantasy, making it one of six stages in the Super Smash Bros. series to be featured as a stage in other fighting games, with the others being the Pyrosphere, Green Hill Zone, Fountain of Dreams, Suzaku Castle, and Dracula's Castle. Midgar's two music tracks are both taken directly from Final Fantasy VII, making Midgar both the stage with the fewest amount of music tracks in Super Smash Bros. for Wii U and the only one lacking any Smash-exclusive arrangements in its lineup. This is also the case in Ultimate, though it is tied with Flat Zone X for the least amount of tracks. Interestingly, in the 3DS version, whenever a match starts or resets in Training Mode, the characters on the floating platforms will always perform their landing animation, as if they start in midair. Midgar is the only stage in SSB4 that can crush, as the Pirate Ship no longer crushes fighters as it did in Brawl. In Training Mode, if the game is paused while a summon is in effect, it will continue its effect indefinitely, continuing to affect other fighters (excluding Odin; instead, if paused upon slashing, the game stays slowed down until unpaused or the camera briefly zooms in on the fighter that he strikes (which doesn't happen if multiple fighters are hit) after they're KOed). Summons such as Ifrit and Bahamut ZERO allow for combos of up to 999 to be registered by the game. A similar exploit can be done on stages like Mario Circuit. If Sonic is fighting on Midgar in the Wii U version, a graphical glitch will occur wherein his eyes appear to reflect the texture of the stage, turning them gray in color. This occurs even on the Ω form of the stage. Despite being a futuristic-looking stage, the Crates and Barrels are wooden. This page was last edited on April 16, 2019, at 02:42.